When you make the investment to install beautiful new kitchen cabinets, you’ll want to protect them and make them last as long as possible. To start things off on the right foot, be sure to follow the product care and maintenance instructions that accompany your new cabinets. For a handy reference, we have compiled a quick checklist. Once your new cabinets arrive, be sure to keep them securely in their original packaging until you are ready to install. This will prevent any unfortunate accidents from scuffing them before they are even displayed. When you are ready to install, have someone help remove them from the boxes, so they can be handled evenly to prevent tilting them, which can dent the edges or lead to an unintentional tipping. During the installation process, handle with care. Once the cabinets are installed, wipe down the finish, in the direction of the wood grain before hanging doors and drawers. Once your cabinet doors and drawers are installed, wipe down the finish again. Then install knobs and pulls and wipe down the entire surface with a clean, damp cloth and wipe dry to avoid moisture damage. Never use commercial or powder detergents, scouring or steel wool pads, spray polishes, or silicone wax. 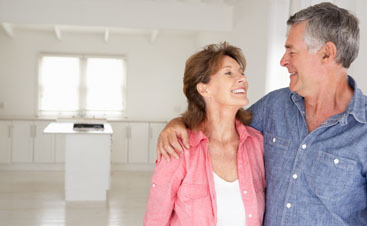 Daily care of your cabinets is the easy part, as most cabinets are low maintenance. 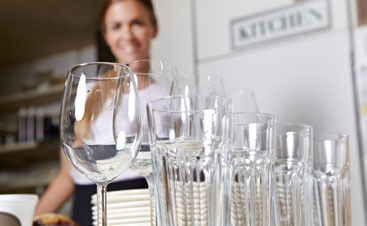 Be sure to wipe up an spills, water marks, or food as they occur. Never hang wet towels over cabinet doors because the moisture can cause great damage over time. 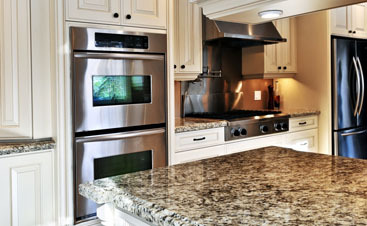 Be sure to clean your stove vent hood regularly to prevent grease from gunking up your cabinets over time. If grease does happen to accumulate, use a small amount of dish or dishwasher soap mixed with water to break up the gunk, be sure to immediately dry the surface with a dry cloth. You can line shelves and drawers with contact paper to protect the surface over time. Most cabinets only require light dusting every few weeks. To dust your cabinets, use a slightly damp cloth followed by a dry cloth or you can use a spray dust remover so long as it is not silicone based. It is recommended that you wash and polish your cabinets once or twice a year. To do this, use a light coat of oil-based furniture polish. If your daily care cleaning has not removed stains or build-up, make a cleaning by mixing baking soda and water or, for really sticky situations, use vinegar and water. Scrub the stain until it is gone, rinse with water, and immediately dry it. Your new cabinets contain a touch-up kit to handle minor nicks and scratches. Prior to attempting to correct any damages, with a stain marker or wood putty stick, be sure to read all package instructions thoroughly. One of our previous articles can serve as a helpful guide. 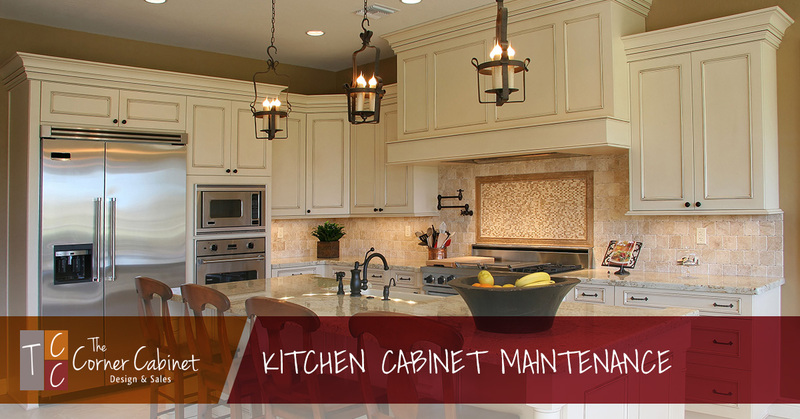 When you take the time to care for your kitchen cabinets, they are sure to look fabulous for years to come. 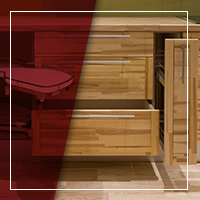 If you have any questions or concerns about your custom made cabinets, contact us at The Corner Cabinet Company.